Perhaps you still have a few years in high school, or are already starting to apply to colleges for next year, however it is never too early or too late to start working towards standing out and achieving your goal of getting into the college of your dreams! The first thing you can do throughout classes is take advanced placement classes. Taking these shows colleges that you are ready for their classes, and actually does help prepare you for what’s head. You might find them challenging, however regardless of your end grade, it shows colleges that you have put in the effort and are ready to work. And if you do manage to get good enough grades, this can even save you money and time later on, as these classes are generally accepted for college credit. It is also extremely important to become as close as possible with your teachers. You will need them for recommendation letters for college. And while they most likely will write you a letter regardless, you are going to want to stand out from your fellow students, as colleges are see standard letters all the time. It is also of great value to fix up your resume and make sure to include all of things you have done. However it is also important not to make it too long, and fit everything on one page, because otherwise, colleges will not be interested, or have the time to read much further. 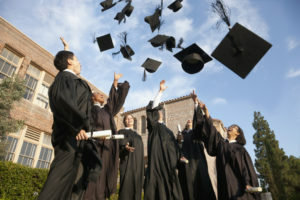 So you are best off researching the things that are most important to your college of choice. However, of course do not make things up just because you think that’s what they are looking for. Another valuable way to increase your college acceptance chances is to join as many extracurricular activities as possible, including clubs, sports, fundraisers and basically everything offered! Engaging in these activities show colleges that you are invested to your school, are an all rounded person and get along with your peers well. Even colleges understand than there is more than just good grades. They want people that are going to positively contribute to campus life. It is also known that the earlier you apply, the better chances you have of getting in. Colleges often give priority to those who have already applied, so if you are already set on a college, then what are you waiting for? And there is nothing more exciting, fulfilling and stress-relieving than receiving an early decision application. 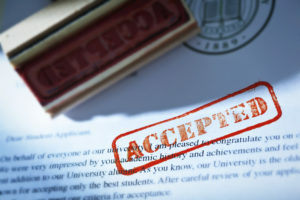 However, if you are still unsure of your dream college, or you have some improving to do on your grades and overall profile, it might be safer to wait to apply. The college application essay is yet another crucial aspect of ensuring success. Make every word count in your essay, take your time and use your English language skills to the fullest, don’t be afraid to sound like Shakespeare. Your application essay can make all the difference against someone with the same grades as you. And do keep in mind as well that every college acceptance is decided by a person. If you can manage to connect with this person, have a conversation with them, ask them questions, email them, call them, show up at an interview, they are more likely to connect with you as well, and feel for you on an emotional level. Of course they have a job to do and certain criteria to look for, but as human beings, if they can put a face and really see how invested you are, they are more likely to allow their emotions to play in. All things being said, getting into the college of your choice is no easy feat, let alone choosing one. It requires a great deal of dedication, and there are many factors taken into consideration. Not only is there a great deal of competition, but often times admissions officers have certain percentages of people they are looking for, or extremely specific traits, and your acceptance could be completely out of your control. However, it never hurt anyone to give it their best shot!